A second Unicorn release made by Shaun Blezard on his Clutter Music label. Some Some Unicorn has evolved from an online collaborative project into a free flowing collective of improvising musicians, poets and artists who value shared experience and community. The band is led by composer and improviser Shaun Blezard and started during his time as New Voice Composer with Sound and Music. The first SSU album was Some Some Unicorn and The Golden Periphery. Since the debut album SSU has evolved into a remarkable live experience. Live the outfit is between 8 and 14 strong and is always different, drawn from many genres but with a focus in free improv, jazz and ambient drone. Touching points for the SSU sound are Alex Cline Ensemble, Talk Talk, Spontaneous Music Ensemble and The Kilimanjaro Darkjazz Ensemble. 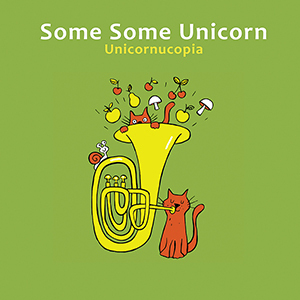 The second SSU album Unicornucopia was the result of a successful crowd funding campaign and features tracks recorded live in the studio, with limited overdubs. Studio sessions were held in Salford, London, Lancaster and Ulverston. Unicornucopia is released in September 2016 and features over 50 players.